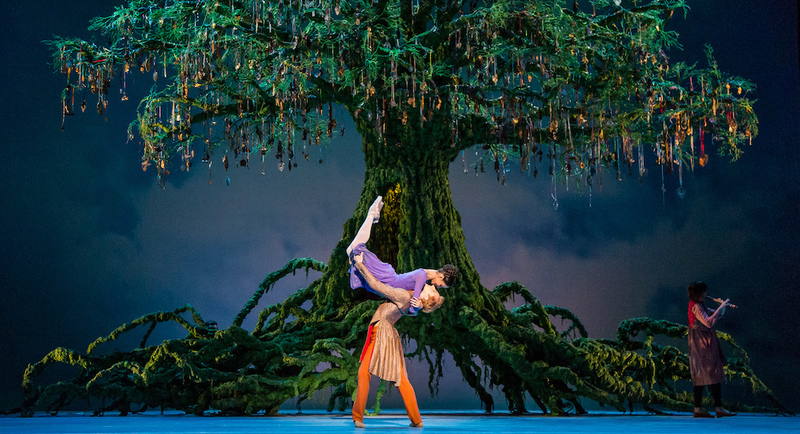 The Royal Ballet's Francesca Hayward and Steven McRae in 'The Winter's Tale'. Photo by Darren Thomas. In another stellar International Series, Queensland Performing Arts Centre (QPAC) has delighted audiences with a double bill season by The Royal Ballet. The company brought Woolf Works by Wayne McGregor and The Winter’s Tale by Christopher Wheeldon – two exceptional works. The Royal Ballet’s Lauren Cuthbertson in ‘The Winter’s Tale’. Photo by Darren Thomas. I arrived at the theatre for the opening night of The Winter’s Tale with high hopes, and I left floating on a cloud. Upon entering the grounds of QPAC, we were greeted with swing dancing during the many varied Let’s Dance outdoor performances accompanying The Royal Ballet’s visit. What an energetic and joyful way to start an all immersing evening of dance! Then we enjoyed a specialty cocktail named for the ballet, which I must say was almost as delicious as the dancing. The tone was set for a splendid experience, which continued onto the next day when I lost myself in the historical Made on the Body: Choreography from The Royal Ballet exhibit in QPAC’s Tony Gould Gallery. And with community engagement through the We All Dance education programme with The Royal Ballet’s teaching artists, QPAC certainly knows how to make the most of such an exclusive international coup. It felt like even the walls of QPAC were celebrating dance with us, with such an atmosphere created by all these special extras. So the scene was beautifully set, but what about the ballet itself? What can I say without just gushing? Wheeldon chose quite a complex, challenging Shakespearean romance to portray with The Winter’s Tale, but his vision was never wavering as he turned poetry into motion. Between the intricate, creative partnering, to the sets which seemed to dance themselves, and the lovely light allegro of the second act against the anguished, tragic adagio of the first and last acts, we were taken on a dramatic, but harmonised journey. 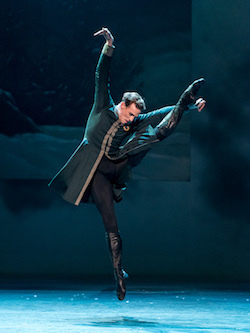 The Royal Ballet’s Edward Watson in ‘The Winter’s Tale’. Photo by Darren Thomas. Edward Watson as King Leontes gave such a passionate, mature and meaningful performance. Lauren Cuthbertson was everything Wheeldon could have asked for as the innocent yet betrayed Queen Hermione, creating such quiet calm in the face of such tragedy, juxtaposed with her husband’s irrational state. Act Two was the absolute highlight of the show with 40 minutes of pure dancing. The moment a stunning central, whimsical tree was revealed, the audience erupted in applause because of its sheer grandeur and beauty. The scene was set for the best act I’ve ever seen. I felt as if the air had lifted, after the dark and complex events of the first act, and a light spring breeze was palpably sweeping over us. The sweet, light allegro, loveable partnering and colourful pastel costumes all come together to create a celebration of young love, and of ballet itself. Aussie Steven McRae stole the show. His boyish, playful persona just shone. He was stunning, with quick feet and enviable ballon. Every time he left the ground, it was perfection. He seemed to create more oxygen in the air with each jump. He embodied the joy that the young prince found in his sweetheart, Perdita, with every single movement. Francesca Hayward as Princess Perdita was delightful. She was sweet, youthful and flawless, with exceptional technique. She was perfectly cast as the young princess. It is no wonder she was promoted to Principal last year. 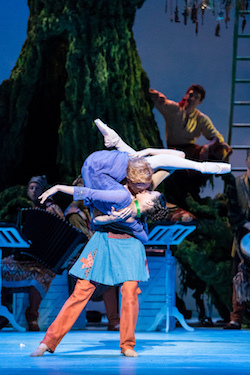 The Royal Ballet’s Francesca Hayward and Steven McRae in ‘The Winter’s Tale’. Photo by Darren Thomas. I wouldn’t expect any less from The Royal Ballet, but the entire cast was divine. Their hard work and dedication to the artform shone with every movement. But Wheeldon did not only choreograph dance steps on the company’s talented dancers. He also choreographed the set to give us a multi-dimensional production. With the ingenious use of silks and projection, he created oceans, sails, waves and more. I felt as if the entire stage was coming to life to give us this story. The Winter’s Tale was so enriching. It is a ballet I will never forget. Congratulations to Wheeldon and The Royal Ballet, and thank you to QPAC for giving Australian audiences such a gift.